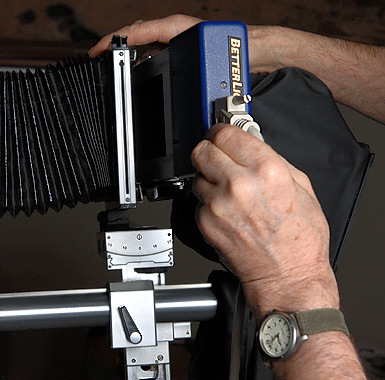 Large format digital capture for art galleries and museums. Major art galleries and museums from around the world recognise the many advantages that specialist, large-format digital capture can offer them.....if done well. It replaces large colour transparencies, for several very good reasons. Considerably greater clarity, partially due to the removal of several of the intermediate steps required when using film. The most minute details, and every subtle colour and tonal variations are now able to be accurately recorded. The purest possible digital information can be captured, with an extremely wide brightness range. This means that all the detail is recorded, from the deepest shadow areas through to the very brightest highlights ......far greater than film allows. An extreme smoothness because of the absence of film grain. Photography, colour-matching to the originals, and making of archival prints for reference purposes; all this can be done on the same visit, unlike when working with film. For clients, this removes all uncertainties, and is more cost effective. Artisan's clients benefit from our investment in a dedicated and matched system, designed to do this particular work supremely well, rather than one more appropriate for general photography. We have thereby removed all the compromises of the past and present. The next page explains a little about how we do it, followed by examples for you to examine in detail. Please contact us to arrange a meeting or to ask questions.